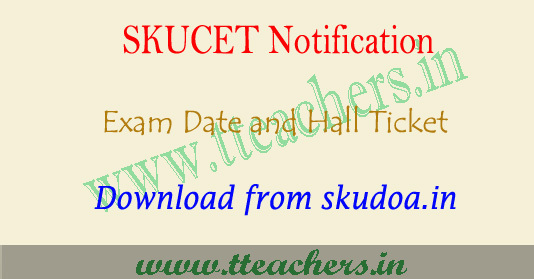 SKUCET 2019 hall ticket download, sku pgcet results 2019 : SKUCET hall ticket 2019 can be downloaded from 1st May to 9th May 2019. SKUCET is the PG common entrance test of Sri Krishnadevaraya University which is conducted for admission to first year pg programmes. It is a university level entrance examination. This entrance test is administered by Sri Krishnadevaraya University. SKUCET 2019 Hall Ticket has been released. In this article, we are providing the details regarding exam dates, how to download the SKUCET 2019 hall tickets. Hall ticket is the mandatory document that is required for appearing the pg admission test in 2019. SKUCET hall tickets 2019 is being available online only. Applicants can download the admit card from our website. Candidates can also access the direct link from here to download the skucet hall ticket 2019. Students are advised to preserve the hall ticket carefully till the completion of admission process. The examination of SKUCET 2019 will be held in offline mode on May 2019. Downloading of hall tickets is start from the 1st May to 9th May 2019. Students are suggested to download their admit cards within the given dates as no further request for availing the admit card will be entertained. The SKUCET result 2019 will be announced in the online mode only. The applicants can access the rank card of SKUCET and the result through the links provided in the website. The applicants can download and keep the generated SKUCET results 2019 with them for the entire admission procedure.